Which brings me to the statement the man on the side of the road gave me. The only thing I can think is that he was referring to the actual roadway bridge. Who knows? Then again, maybe Mr. Travis has incorrect information. However, with every reputable reference saying that Campbell’s is “the last”, it’s hard to refute the evidence that this isn’t an authentic structure. How do we define “authentic?” On Travis’ list the earliest is, of course, Campbell’s Bridge, but the next earliest is a bridge in a subdivision in Greenville built in 1985. Will there come a point in time when that bridge and the Mayfield bridge are considered authentic? It depends, but I don’t think so. For a property to be listed, it must meet at least one of the four NRHP key criteria. Information on architectural styles, association with various aspects of social history and commerce, and ownership are all integral parts of the nomination. Each nomination generally provides a narrative section which describes the site or building in detail and justifies why it is historically significant. The NRHP criteria fall into four categories. To meet the “Event” category, criterion A, the property must make a contribution to the broad patterns of American history. Criterion B, “Person,” is associated with significant people in the American past. The third criterion, C, “Design/Construction,” is affiliated with the distinctive characteristics of the building through its construction and architecture, including having high artistic value or being the work of a master. The final criterion, D, “Information potential,” is satisfied if the property has yielded or may be likely to yield information important to prehistory or history. The criteria are applied differently for different types of properties, for instance, maritime properties have different application guidelines than buildings. Perhaps if these structures stick around long enough they may fall under the A category. 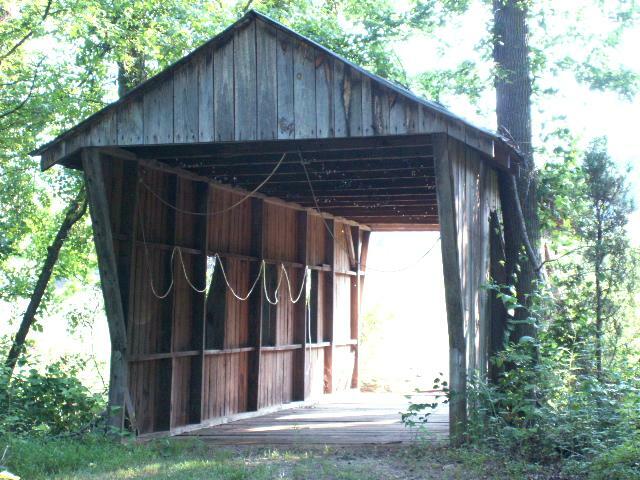 However, to be considered an authentic covered bridge it must have been originally designed to handle regular traffic as part of a public roadway (just my guess, no citations available.) Given that criteria, the Mayfield Road, the subdivision bridge, and all the golf course bridges don’t qualify. So, I guess Campbell’s Bridge retains its lonely status as the last remaining covered bridge in South Carolina, as long as the definitions are clarified. still a great structure… but I agree that it would be authentic if it was built for the purpose of a road bridge…meant for traffic. I know of a covered on a sort of public rd here in greenville that is a traffic bridge. I don’t want word to get out, but it’s awesome to shoot at.